SS Rajamouli directing RRR is fast progressing with its shoot at Aluminum Factory in Hyderabad where the director is canning an action sequence on mega power star Ram Charan and fighters. Young Tiger Ntr who is the other lead star in the film is not part of this action sequence. So, he is flying to Dubai to buy some clothes for his role in the film. 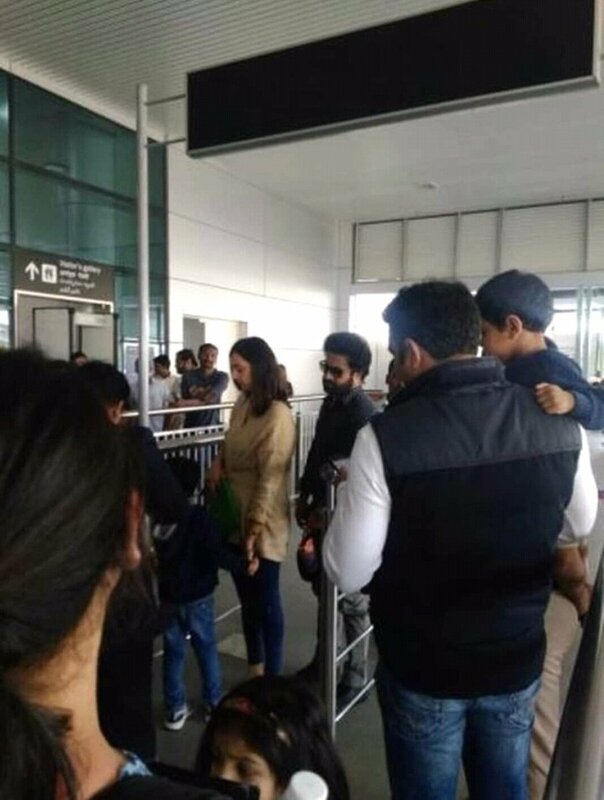 He is spotted at airport along with his wife Lakshmi Pranathi and kids. Ntr in the above picture can be seen with grown beard. RRR, as we reported earlier, will have two timelines- one is during Independence era where Charan, Ntr can be seen as friends, whereas in present era they will be seen as brothers. DVV Danayya is producing the flick on massive budget of Rs 300 Cr.